NFL Betting Odds: Can the Pittsburgh Steelers Rebound in 2010? At 11-1 NFL odds to win the AFC and compete in this year’s Super Bowl, they’ll need some work to make it all the way to big D. The Steelers enter the 2010 NFL schedule with more questions than answers, especially for a team that won the NFL title two years ago. First off, can Ben Roethlisberger stay out of trouble, serve his suspension, and come back at the high level that is expected of an elite quarterback? The early NFL betting odds say yes. He has been friendlier with teammates and fans, has led the team in all drills, and seems to be on the way back. For now, though, he is more of a question mark than an exclamation point. 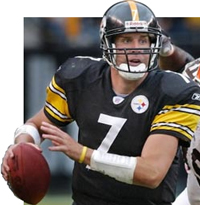 Byron Leftwich is the early pick to be his replacement and, while a serviceable quarterback, he is no Big Ben and the Steelers will be lucky to start the season 2-2 with him at the helm. The Pittsburgh Steelers also have questions on the offensive line for the 2010 NFL schedule, where they have given-up more than 40 sacks 4 years in a row and have struggled to run the ball during crucial game situations, at cornerback where they had two interceptions among cornerbacks all season, and at wide receiver, where they need to find a replacement for Santonio Holmes. The most important key to the season, though, is the health of two key defensive players who missed extended time in 2009 – defensive end Aaron Smith and All-Pro safety Troy Polamalu. If Polamalu is healthy, he is a force, and makes all the defensive players better. Bet on the Steelers to rebound if their safety is on the field, but, if he is one sidelines, the Steelers will fall to the middle of the pack and those 11-1 odds might not look too bad. Bet the Steelers to win the AFC at Bodog.com. The NFL odds makers at the Las Vegas style online sportsbook Bodog.com, welcome players from across the globe to make their NFL picks & predictions early.